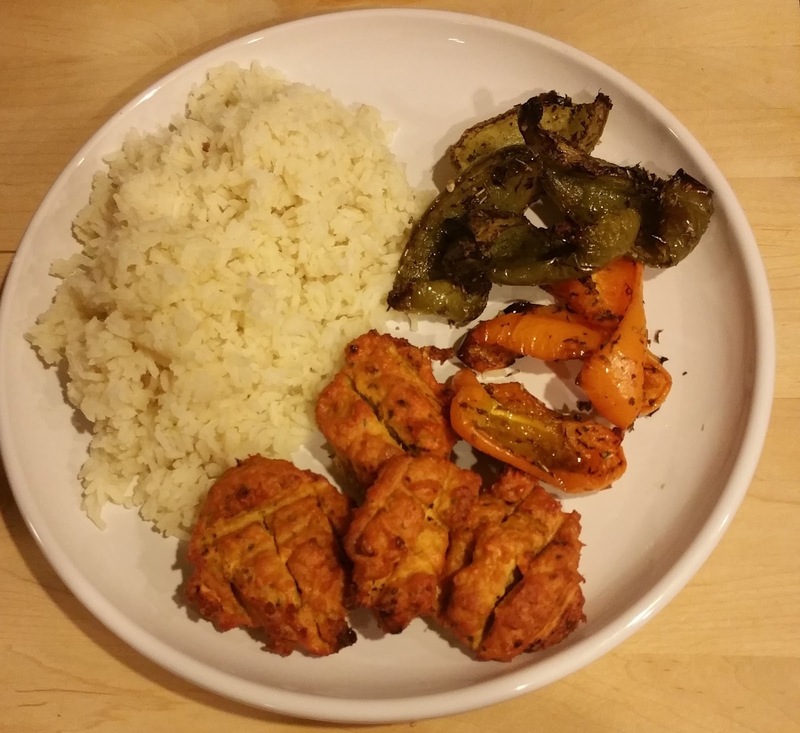 Fit Fluential Mom: It's Time for Kabobs! Lula Kabobs! Last minute, game time decision made for dinner last night! Husband is sick of squash (how dare he!!) and is bored with the same ol' same ol' dishes I make. So, while at the store getting some deli meats, I took a walk by the meat counter and saw that lula kabob was on sale! If you've never heard of it, it's spiced ground chicken (can be lamb too). It's a middle eastern food typically grilled on kabob sticks on a barbecue but, considering it was raining in So Cal yesterday, barbecuing wasn't an option for me. So.....I decided I'd make them in the oven. The easiest way I know how. I bought some bell peppers too since that's what usually goes on kabobs and some white rice since that's how kabobs are typically served. Paired it with a Greek salad and the dinner was a HIT. Now, when I first put it in the oven, I wasn't sure how it would pan out but it turned out great! Here's the recipe! I made enough for a family of 4 plus leftovers for meal prep for the rest of the week for me. If you're just making it for one meal, you probably only need 1 lb of lula. 1. 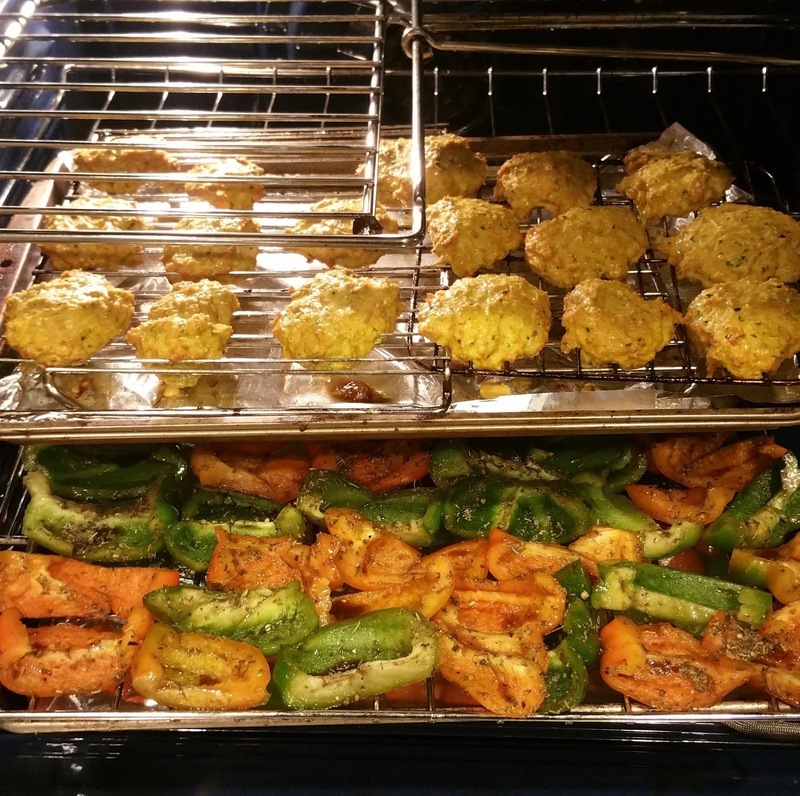 Spray a baking rack with non-stick spray and place it on top of a cookie sheet. Preheat your oven to 400 degrees (375 if it's convection. 2. Form the lula into small patties similar to a small hamburger patty but thicker. Place them on the cookie sheet and set aside. 3. Slice the bell peppers into about 5 pieces length wise. Throw out the seeds and stem. Marinate them in balsamic vinegar, lemon juice and your favorite no salt seasoning. I only had time to marinate them for about 10 minutes but you can marinate them for as long as you'd like. The longer you marinate, the more flavor they absorb. 4. When you're ready to make them, place them on a cookie sheet that has been sprayed to prevent sticking as well. 5. 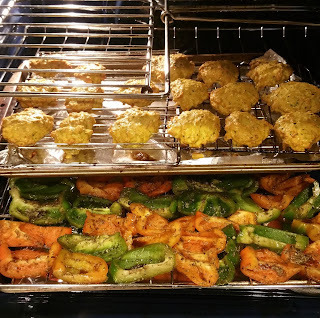 Bake the lula and the bell peppers in the oven for about 35to 45 minutes. Check it regularly. Cook until the bell peppers begin to curl up and brown lightly. Or essentially until they're the way YOU like them. I like them really toasted and almost burnt but hubby doesn't so we compromise. 6. While baking the lula and bell peppers, pour the rice in a sauce pan and add the 2 cups of broth along with the 2 cups of water. There should be two parts water for every one part rice. 7. Bring it to a boil, cover it once it's boiling and simmer until all of the liquid is soaked up and the rice is done. 8. Serve together on a plate and, if you happen to have some tzatziki or know where to pick some up, serve it with some on the side! Tzatziki is a yogurt sauce made with cucumbers, garlic, salt, olive oil, red wine vinegar and dill. Sometimes lemon juice and parsley is added to it.